It is generally accepted that the standard deck of playing cards we use for everything from three-card monte to high-stakes Vegas poker evolved from the Tarot. 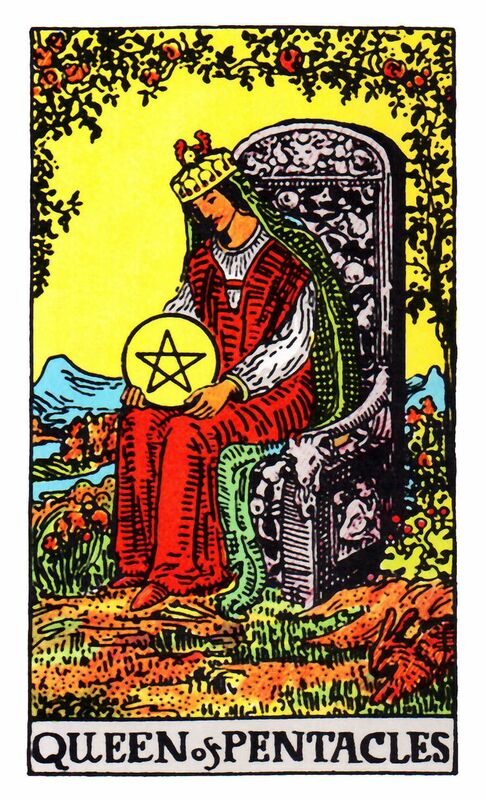 “Like our modern cards,” writes Sallie Nichols, “the Tarot deck has four suits with ten ‘pip’ or numbered cards in each…. In the Tarot deck, each suit has four ‘court’ cards: King, Queen, Jack, and Knight.” The latter figure has “mysteriously disappeared from today’s playing cards,” though examples of Knight playing cards exist in the fossil record. 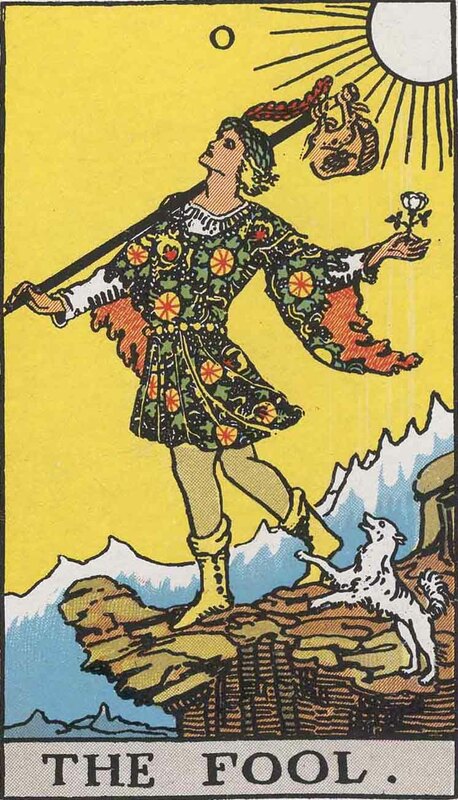 The modern Jack is a survival of the Page cards in the Tarot. 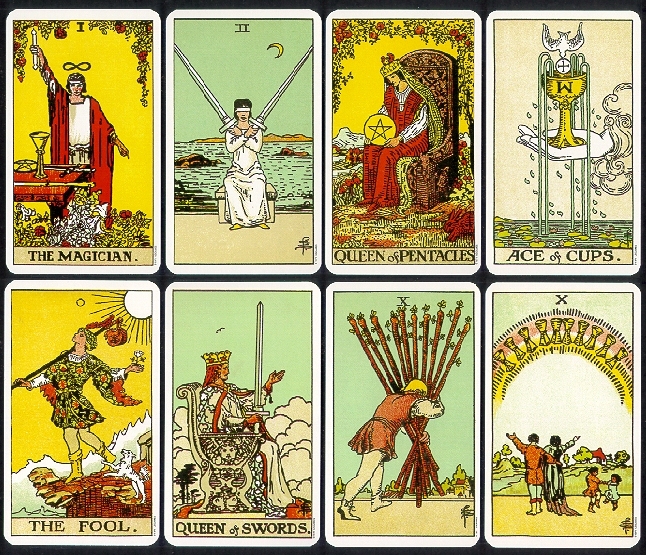 (See examples of Tarot court cards here from the 1910 Rider-Waite deck.) The similarities between the two types of decks are significant, yet no one but adepts seems to consider using their Gin Rummy cards to tell the future. The eminent psychiatrist Carl Jung, however, might have done so. 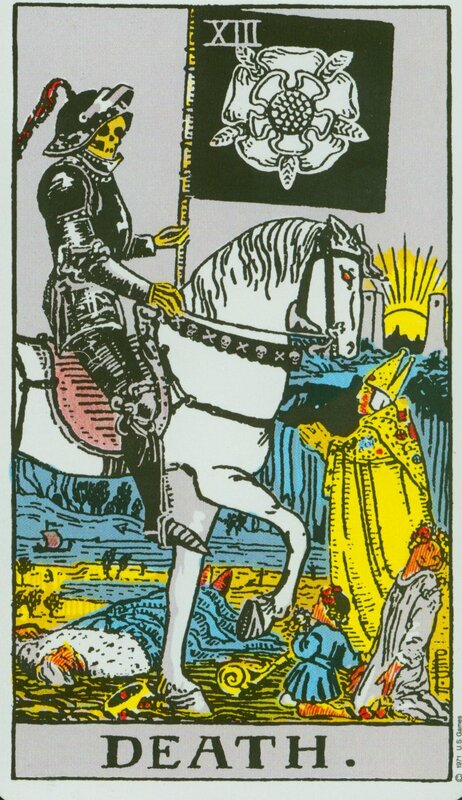 As Mary K. Greer explains, in a 1933 lecture Jung went on at length about his views on the Tarot, noting the late Medieval cards are "really the origin of our pack of cards, in which the red and the black symbolize the opposites, and the division of the four—clubs, spades, diamonds, and hearts—also belongs to the individual symbolism. Later interpreters of Jung doubted that his experiments with divination as an analytical technique would pass peer review. “To do more than ‘preach to the converted,’” wrote the authors of a 1998 article published in the Journal of Parapsychology, “this experiment or any other must be done with sufficient rigor that the larger scientific community would be satisfied with all aspects of the data taking, analysis of the data, and so forth.” Or, one could simply use Jungian methods to read the Tarot, the scientific community be damned. 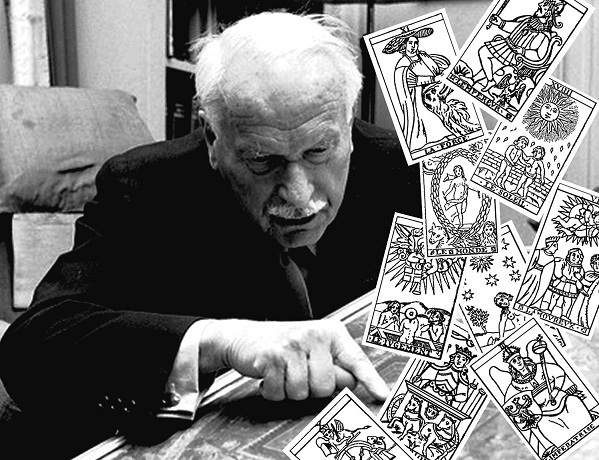 As in Jung’s many other creative reappropriations of mythical, alchemical, and religious symbolism, his interpretation of the Tarot inspired those with mystical leanings to undertake their own Jungian investigations into parapsychology and the occult. Inspired by Jung’s verbal descriptions of the Tarot’s major arcana, artist and mystic Robert Wang has created a Jungian Tarot deck, and an accompanying trilogy of books, The Jungian Tarot and its Archetypal Imagery, Tarot Psychology, and Perfect Tarot Divination. You can see images of each of Wang’s cards here. His books purport to be exhaustive studies of Jung’s Tarot theory and practice, written in consultation with Jung scholars in New York and Zurich. Sallie Nichols’ Jung and Tarot: An Archetypal Journey is less voluminous and innovative—using the traditional, Pamela Coleman-Smith-illustrated, Rider-Waite deck rather than an updated original version. But for those willing to grant a relationship between systems of symbols and a collective unconscious, her book may provide some penetrating insights, if not a recipe for predicting the future. Blade Runner, as anyone who's seen so much as its first shot knows, takes place in the Los Angeles of November 2019. Though the film flopped when it came out in 1982, the acclaim and fans it has drawn with each of the 35 years that have passed since didn't take long to reach the kind of critical mass that demands a sequel. After numerous rumors and false starts, the October release of Blade Runner 2049, produced by Blade Runner director Ridley Scott and directed by Arrival director Denis Villeneuve, now fast approaches. The new movie's promotional push, which has so far included trailers and making-of featurettes, has now begun to tell us what happened between 2019 and 2049. "I decided to ask a couple of artists that I respect to create three short stories that dramatize some key events that occurred after 2019, when the first Blade Runner takes place, but before 2049, when my new Blade Runner story begins," says Villeneuve in his introduction to the brand new short above. Taking place in the Los Angeles of 2036, the Luke Scott-directed piece "revolves around Jared Leto’s character, Niander Wallace," writes Collider's Adam Chitwood, who "introduces a new line of 'perfected' replicants called the Nexus 9, seeking to get the prohibition on replicants repealed," the government having shut replicant production down thirteen years before due to a devastating electromagnetic pulse attack for which replicants took the blame. A timeline appeared at Comic-Con this past summer covering the events of the thirty years between Blade Runner and Blade Runner 2049, though in very broad strokes: in 2020 "the Tyrell Corporation introduces a new replicant model, the Nexus 8S, which has extended lifespans," in 2025 "a new company, Wallace Corp., solves the global food shortage and becomes a massive super power," in 2049 "life on Earth has reached its limit and society divides between Replicant and human." The two other short films to come should just about tide over fans until the release of Blade Runner 2049 — not that those who've been waiting for a new Blade Runner movie since the 1980s can't handle another month. The short Blade Runner 2049 prequel, entitled "Nexus: 2036," will be added to our list, 1,150 Free Movies Online: Great Classics, Indies, Noir, Westerns, etc..
British poet and speculative fiction writer recently got a little creative with the Periodic Table, writing one haiku for each element. your sweet days long gone. 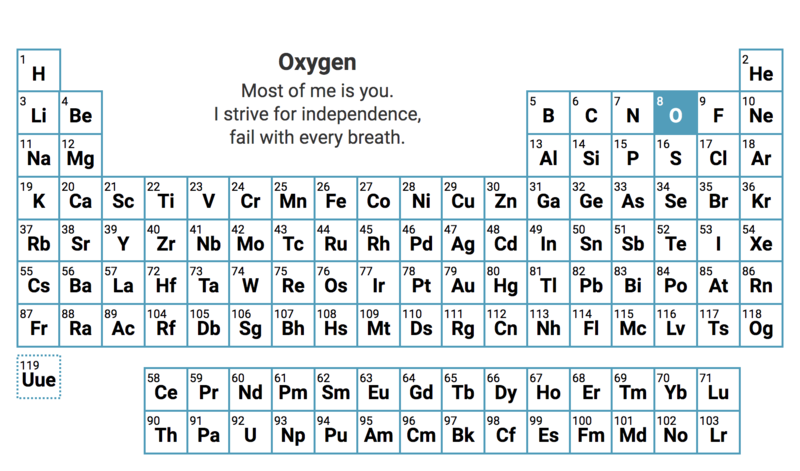 You can access the complete Elemental haiku here. Note: An earlier version of this post appeared on our site in April, 2012. In the recorded history of philosophy, there may be no sharper a mind than Ludwig Wittgenstein. A bête noire, enfant terrible, and all other such phrases used to describe affronts to order and decorum, Wittgenstein also represented an anarchic force that disturbed the staid discipline. His teacher Bertrand Russell recognized the existential threat Wittgenstein posed to his profession (though not right away). When Wittgenstein handed Russell the compact, cryptic Tractatus Logico-Philosophicus, he admitted his student had gone beyond his own analytic insights in the pursuit of absolute clarity. Wittgenstein’s longtime mentor and friend, famed logician and mathematician Gottlob Frege, expressed criticism. Some have suggested he did so in part because he saw that Wittgenstein had rendered much of his work irrelevant. Alain de Botton gives a brief but fascinating sketch of Wittgenstein's ideas and incredibly odd biography in the School of Life video above. The eccentric Austrian savant, he asserts, “can help us with our communication problems” through his penetrating, though often impenetrable, claims about language. That may be so. But we may need to redefine what we mean by “communication.” According to Wittgenstein in the Tractatus, an overwhelming percentage of what we obsess about on a daily basis—political and religious abstractions, for example—is so totally incoherent and muddled that it means nothing at all. He revised this opinion dramatically in his later thought. Though he published nothing after the Tractatus and soon became a near-recluse after his startling entry into analytic philosophy, notes from his students were collected and published as well as a posthumous book called Philosophical Investigations. This version of Wittgenstein’s approach to the problems of communication involves a development of the “ostensive”—or demonstrative—role of language. Wittgenstein made an argument that language can only serve a social, rather than a personal, subjective, function. To make the point, he introduced his “Beetle in a Box” analogy, which you can see explained above in an animated BBC video written by Nigel Warburton and narrated by Aidan Turner. The analogy uses the idea of each of us claiming to have a beetle in a box as a stand in for our individual, private experiences. We all claim to have them (we can even observe brain states), but no one can ever see inside the theater of our minds to verify. We simply have to take each other's word for it. We play “language games,” which only have meaning in respect to their context. That such games can be mutually intelligible among individuals who are otherwise opaque to each other has to do with our shared environment, abilities, and limitations. Should we, however, meet a lion who could speak—in perfectly intelligible English—we would not, Wittgenstein asserted, be able to understand a single word. The vastly different experiences of human versus lion would not translate through any medium. Just above, we have an explanation of this thought experiment from an unlikely source, Ricky Gervais, in an attempted explanation to his comic foil Karl Pilkington, who takes things in his own peculiar direction. Though Wittgenstein used the idea for a different purpose, his observation about the unbridgeable chasm between humans and lions anticipates Thomas Nagel’s provocative claims in the 1974 essay “What is it like to be a bat?” We cannot inhabit the subjective states of beings so different from us, and therefore cannot say much of anything about their consciousness. Maybe it isn’t like anything to be a bat. Luckily for humans, we do have the ability to imagine each other’s experiences, in indirect, imperfect, roundabout, ways, and we all have enough shared context that we can, at least theoretically, use language to produce more clarity of thought and greater social harmony. The memo, as Megan Molteni and Adam Rogers write at Wired, “is a species of discourse peculiar to politically polarized times: cherry-picking scientific evidence to support a pre-existing point of view.” Its specious evolutionary psychology pretends to objectivity even as it ignores reality. As Mulder would say, the truth is out there, if you care to look, and you don’t need to dig through classified FBI files. Just, well, Google it. No, not the pseudoscience, but the careers of women in STEM without whom we might not have such a thing as Google. It might surprise today’s software makers that one of the founding fathers of their boys’ club was, in fact, a mother—and that should give them pause as they consider why the gender inequality of the Mad Men era persists to this day. Hamilton was indeed a mother in her twenties with a degree in mathematics, working as a programmer at MIT and supporting her husband through Harvard Law, after which she planned to go to graduate school. “But the Apollo space program came along” and contracted with NASA to fulfill John F. Kennedy’s famous promise made that same year to land on the moon before the decade’s end—and before the Soviets did. 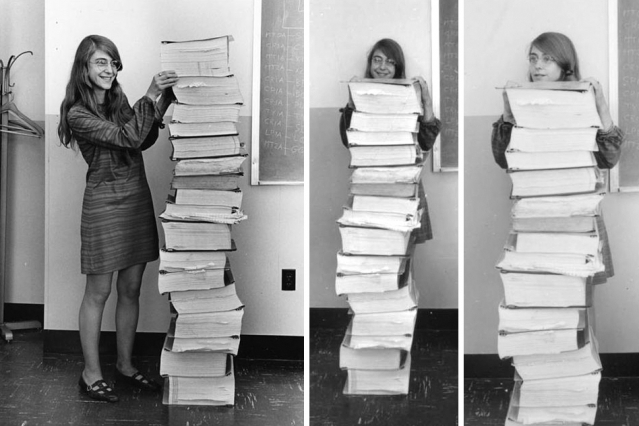 NASA accomplished that goal thanks to Hamilton and her team. 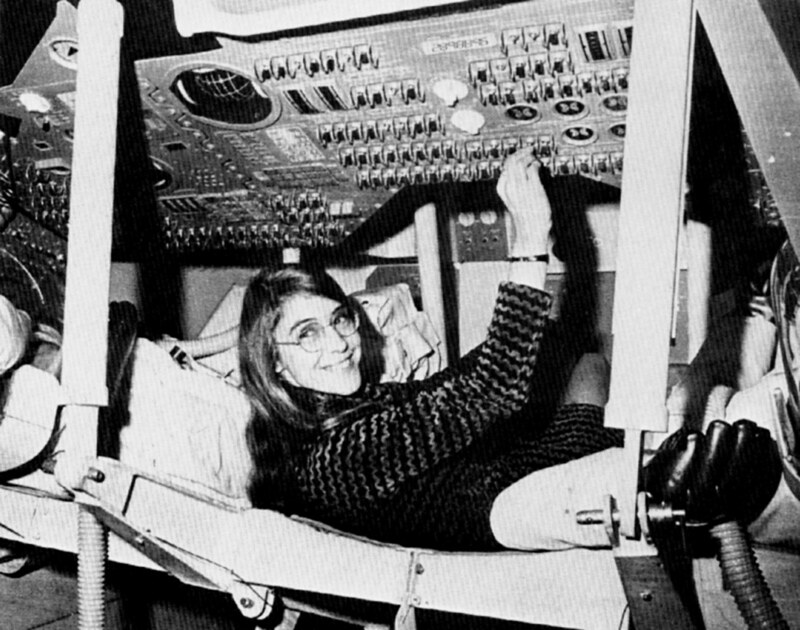 As Hank Green tells it in his condensed history above, Hamilton “rose through the ranks to become head of the Apollo Software development team.” Her focus on errors—how to prevent them and course correct when they arise—“saved Apollo 11 from having to abort the mission” of landing Neil Armstrong and Buzz Aldrin on the moon’s surface. McMillan explains that “as Hamilton and her colleagues were programming the Apollo spacecraft, they were also hatching what would become a $400 billion industry.” At Futurism, you can read a fascinating interview with Hamilton, in which she describes how she first learned to code, what her work for NASA was like, and what exactly was in those books stacked as high as she was tall. As a woman, she may have been an outlier in her field, but that fact is much better explained by the Occam’s razor of prejudice than by anything having to do with evolutionary determinism. Note: You can now find Hamilton's code on Github.